This morning we went for a nice walk in the forest around Lake Duluti. I was thinking I'd probably share some pictures of the forest and write about how the forest and savanna are connected by movements of all sorts of species. But then I encountered a classic mixed species feeding group of forest birds, and thought that might be a whole lot more interesting to talk about. My 3-year-old son ran around a corner and flushed something from the path. Being (sometimes) well trained in these matters he stopped and informed us he'd seen a bird. 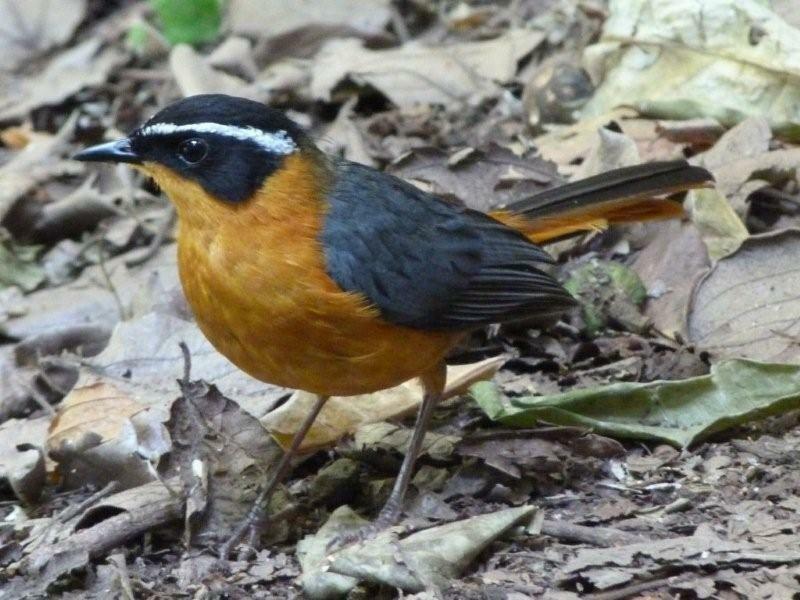 I could hear greenbuls around and said it was probably one of those, but then a red-capped robin-chat hopped out. And whilst I was watching that, a scuffle in the bush behind me turned into one, then two and finally three Ruppell's (or were there white-browed too) robin chats were feeding. In the bush behind a white-starred forest robin was hopping about (sorry, no pics), and then (finally) I found the greenbuls I'd been hearing - grey-olive greenbuls, and something of a speciality of Lake Duluti being easier to see there than just about anywhere else I know. 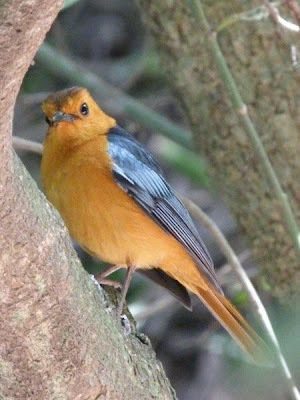 Now, birding in tropical forests is often a frustrating experience. You hear a few calls, but see little. Until suddenly, as today, loads of birds all at once. Here in Tanzania you get this phenomenon both in the forests proper as today, but also in the dry forests and woodlands of the savannah (and particularly in miombo - if you've ever looked for bits in miombo you'll know quite how empty it can be for ages, before suddenly you find a little group). Why is this? Why do we get mixed species flocks in tropical forests? To most guides based here, there's nothing unusual about this, but it is pretty different to the experience most northern birders will be familiar with - in temperate forests there's usually birds all around, all the time - only in the harsh winter period do you get forests apparently empty of birds (and of course many have migrated for the season), and then a mixed group of several species. But perhaps this gives us some clue - the relative harshness of the environment. Despite appearances, tropical forests can be a fairly difficult place to survive in, not because there's no food there, there's usually plenty of invertebrate life around, but for most birds just any old insect won't do - it's got to at least be the right size and, perhaps most importantly, has to be accessible and there really are lots of places to hide in a forest! So, despite the tourists view of tropical forests teeming with life, if you're at all fussy about what you eat (and, let's face it, most things are), they're tricky places to make a living. Add to that the fact that there are plenty of things out to eat you too, and life in the tropical forest is very hard indeed. Just as it is in the incredibly low nutrient miombo woodland, and most other savanna woodlands, at least seasonally. Giant millepedes would be great food for some - but not everyone! So, joining friends is a good way to deal with it – more eyes to look for predators, more eyes to look for food. Of course, you could just hang out with other individuals of the same species and many birds do this – but actually, when you do find food, you don't really want competitors to eat it all up before you can, and your biggest competitors are going to be other birds of the same species. They'll have exactly the same foraging strategy as you, and they'll be looking out for exactly the same food as you. So whilst I'd get the advantages of lots of eyes from hanging out with conspecifics, you might be better off hanging out with different species that are each looking for slightly different food from you. What's more, you might even find more of your food if you hang out with other species, as in the process of their foraging, they might disturb the food you're looking for in exactly the same way a lot of birds forage around grazing mammals. So many species prefer to join mixed-species flocks, to get the all the advantages of lots of eyes, but few of the disadvantages of intense competition. And if, as today, you come across a particularly rich rood resource like a bunch of termites on the ground, there'll be so much food for all, it's not a problem to be in a large group (which is why a lot of birds that habitually go around in large groups like finches feed on things that are, when you find them, extremely abundant, much more so than any one bird could eat on it's own). Soldier Pansy, Junonia terea (I think) were common and probably good to eat - but only if you can catch them! 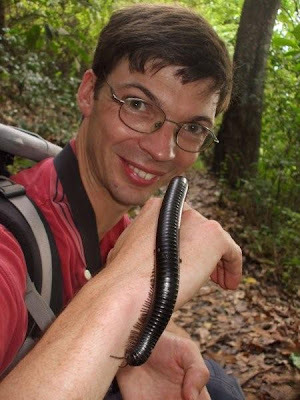 Interestingly, the same sorts of thing happen in South American forests and many of them there are particularly associated with driver ants (the South American answer to our safari ants or Siafu). 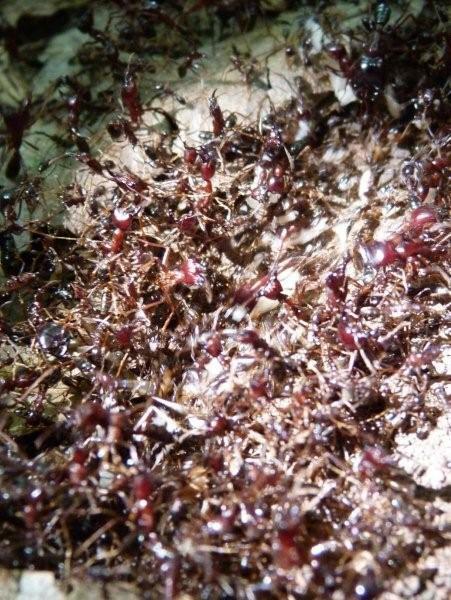 The birds forage along the moving front of the ant group, either eating the ants themselves, or the animals fleeing the upcoming invasion. I'm not quite sure why this doesn't seem to happen with siafu – there were several trails in the forest this morning, but as usual no birds attending. Any idea? to me this is a Ruppell's with its thin eye brow which is always wider on White-browed. So, I've had a number of thoughts on this robin chat. 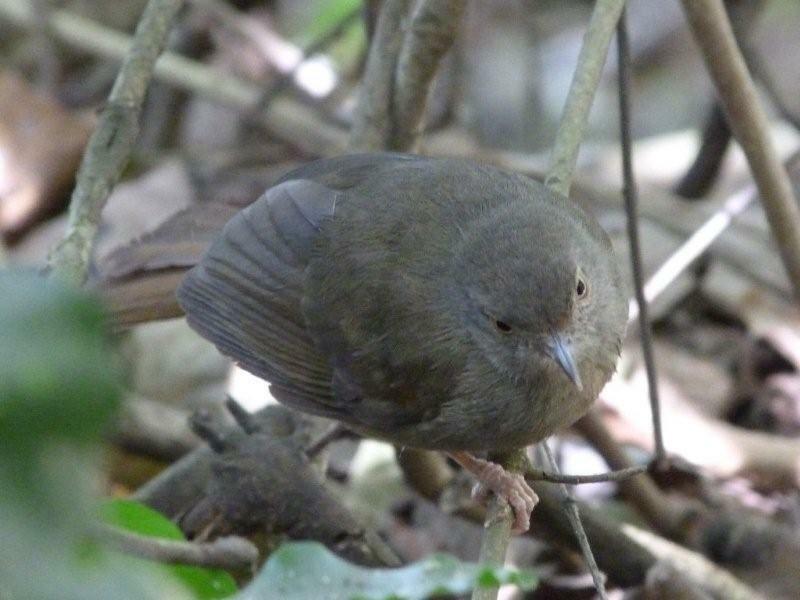 Features I'm told to look for are: width of white-brow (as Itai and others say), colour of wings (black for Ruppell's, blue-grey for white-browed), colour of central tail features - black for Ruppell's, brown for White-browed. I've also been told that if they're not singing, there might be nothing consistent to help. Having looked over lots of pictures on the internet from various locations where only one species should be present I'm concluding - (1) the colour of the central tail feathers is very tricky. 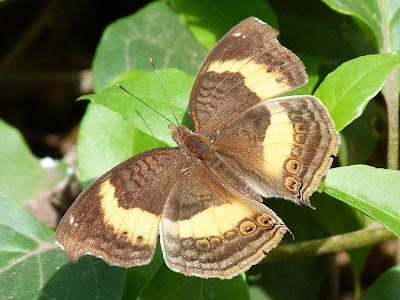 (2) The wing colour works in Ethiopia, but probably not elsewhere. (3) Eyebrow width is difficult, except for extremes. And to add to that, when I've caught these birds for ringing in the past they show some serious ability to flare (widen) the eyebrow when they want to! It's obviously a signal, so I'd expect it to be movable. On this bird I'm changing my mind and tending towards Ruppell's because the eyebrow really is rather narrow - but I'm not sure and I think I might tend to agree that certain ID in the field without calls is, at the moment, not always possible... But we're learning!